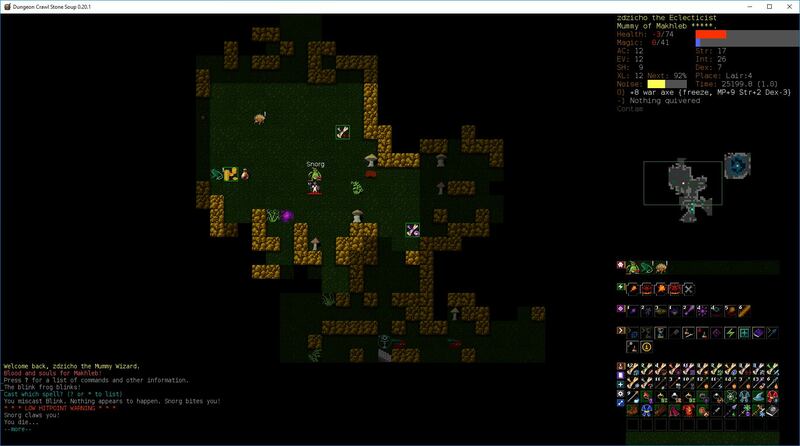 Dungeon Crawl Stone Soup version 0.20.1 (tiles) character file. You are on level 4 of the Lair of Beasts. Makhleb is extremely pleased with you. You have visited 2 branches of the dungeon, and seen 14 of its levels. You have also visited: Labyrinth and Sewer. You have collected 1293 gold pieces. You have spent 588 gold pieces at shops. It affects your strength (-4). You have 15 spell levels left. You do not eat or drink. Your flesh is vulnerable to fire. You are immune to unholy pain and torment. A porcupine comes into view. Found a scroll labeled GIABLUS CAUZ. The porcupine closely misses you. Found a fuming orange potion. You see here a scroll labeled PUETEMP BEPNUY. Snorg bites you but does no damage. You block Snorg's attack. Snorg barely misses you. Snorg bites you! Snorg claws you but does no damage. Snorg claws you! 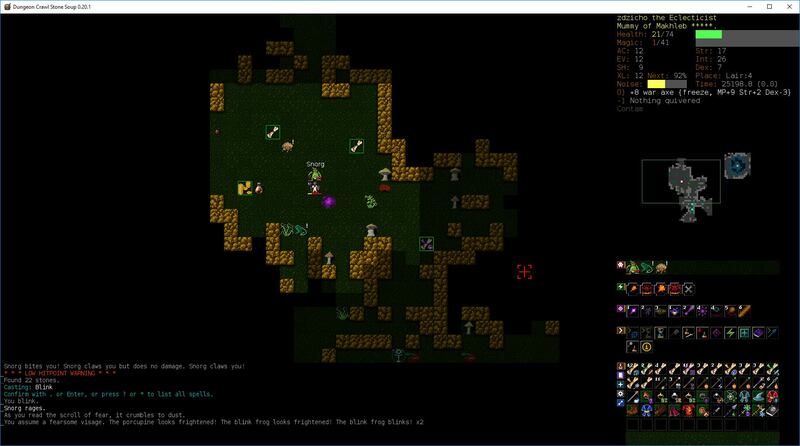 You can see Snorg (berserk), a blink frog (fleeing) and a porcupine (fleeing). 0 | D:1 | zdzicho the Mummy Wizard began the quest for the Orb. 35 | D:1 | Found a snail-covered altar of Cheibriados. 4314 | D:2 | Found a blossoming altar of Fedhas. 4316 | D:2 | Found a deep blue altar of Sif Muna. 4317 | D:2 | Found a bloodstained altar of Trog. 4649 | D:3 | Found a glowing drain. 6418 | D:3 | Found a radiant altar of Vehumet. 8281 | D:4 | Found a burning altar of Makhleb. 9664 | D:5 | Found Ofomodo's Assorted Antiques. 9693 | D:5 | Found Qetzud's Antique Weapon Shop. 10107 | D:5 | Found Ileiti Ubiu's Food Shop. 10112 | D:6 | Found Bory's Antique Weapon Emporium. 10526 | D:5 | Found Coargh's Book Shop. 10843 | D:6 | Found Lona Ara's Assorted Antiques. 10844 | D:6 | Found Lozxubuo's Magic Scroll Boutique. 10867 | D:6 | Found Uzaphast's Assorted Antiques. 10891 | D:6 | Found a snail-covered altar of Cheibriados. 10916 | D:6 | Found Xonaocs Zeer's Antique Armour Shop. 11343 | D:6 | Found a staircase to the Ecumenical Temple. 13624 | D:5 | Found Ulafur's Magic Scroll Shop. 14991 | D:8 | Found a glowing golden altar of the Shining One. 16384 | D:9 | Found a staircase to the Lair. 17024 | D:8 | Found a basalt altar of Yredelemnul. 18576 | Lair:1 | Found a labyrinth entrance. 19713 | D:10 | Found an iron altar of Okawaru. 22992 | Lair:3 | Found a staircase to the Snake Pit. 23619 | Lair:3 | Found a staircase to the Shoals. Snorg can hit for up to 74 damage in one action while berserk, not 30. Snorg is also female, btw. Thank you for remembering to include a character dump. However, you neglected to include which items you have identified. This is important because a scroll of blinking is the only thing with a remotely decent chance of saving you. If you have blinking unidentified, I would read an unidentified scroll stack hoping to get blinking. I cannot tell you which stack is most likely to be blinking because I don't know where you found each scroll (scroll generation chances are different on every level), but even picking one of the unidentified scrolls at random will give you a better chance than anything else you can do here. If you have blinking identified (and therefore don't have a scroll of blinking) then you might as well quit because nothing else has a remotely decent chance of saving you. I will say that using the wand of acid would be a complete waste of a turn since it will neither kill Snorg nor do anything to stop Snorg from killing you. This is somewhat ironic because there's a scroll of blinking right there. Probably should have picked that up when you saw it. Beargit wrote: This is somewhat ironic because there's a scroll of blinking right there. Probably should have picked that up when you saw it. No comment on this death to snorg, but: Use Mahkleb's invocations, especially summon lesser demon. Minor destruction is also really good. Did you die yet? Probably best bet is to walk away and pray that she misses and loses berserk. If she is slow you will escape, but most likely you are going to die. Second bet is to try para but that would depend on the success chance. If it was anything like 10% or greater I would be tempted to give it a shot. Hell even 5% chance is better than nothing, you can always roll a 20.